Why should I call the Leak Doctor? Leak Doctor can locate your water leak and minimize the damage to your home or building. It is better for you, the customer, to have a specialist pinpoint the problem before excavation. The cost of pursuing a leak with a jackhammer or sledgehammer without our help far outweighs Leak Doctor’s fee for locating the problem. I think I may have a leak, how do I read my water meter? 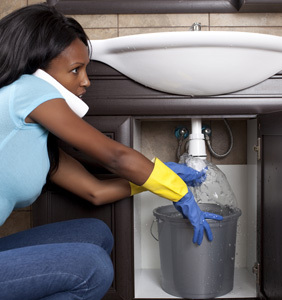 First, make sure all valves are turned off and there are no leaking faucets or toilets. Then, you want to locate your meter box, which is typically located in front of your property near the street. Carefully remove the lid and raise the cap on the meter dial. The display dial is similar to a clock; locate the red triangle at the lower left side on the dial of meter. The triangle should not turn unless you are using water. If the triangle is turning, you may have a leak. I think my pool is leaking, how do I check to make sure? 1. Bring the pool water to its normal level. 2. Fill an empty bucket with pool water to about 1 inch from the top of the bucket. (by filling the bucket close to the top you are ensuring that air movement over the surface of the bucket will be similar to that of the pool). 3. Place the bucket on the first or second step of the pool. To keep it from floating away it may be necessary to place a brick or a rock into the bucket. (by placing the bucket into the pool water you are ensuring that the water temperature of each will be similar). 4. Mark the water level inside the bucket. 5. Mark the water level of the pool on the outside of the bucket, on the pool wall, or skimmer faceplate. 6. Operate the pool for 24 hours as it has been operated when a leak was first suspected. 7. After 24 hours, compare the two levels. If the pool water (outside mark) goes down more than the bucket's inside water level, there is probably a leak. For residential calls, we charge a flat rate for leak detection service. Commercial jobs are individually quoted. Contact us for pricing details. Leak Doctor utilizes a variety of electronic leak detection equipment with various sensitivity levels to locate leaks in plumbing whether the leak is underground or in slabs, asphalt, walls, etc. I can see water coming up through the slab or wall; why do I need leak detection? When water pipes leak, water will travel the path of least resistance and could end up surfacing many yards away. What is a “skimmer” on a pool? The pool skimmer is located in the wall of your pool and it connects to your pool’s suction pump and helps to filter debris from the top of your pool. How do you check for pool leaks? We inspect pools for structural cracks/defects by performing a dye test. We also perform a hydrostatic test to check your pool’s plumbing lines for leaks. How do you test for sewer odors? We inject harmless smoke into your drain line to determine if there is a leak in the sewer system or roof vent connections within your property. After a heavy rain, I am experiencing water intrusion in my home. Can you detect structural leaks? Yes. Leak Doctor uses infrared technology to locate structural leak problems. Structural leaks can be difficult to ascertain because of the nature of how water travels. That’s why we recommend that you call a professional to locate the source of the water intrusion, before attempting to make repairs on your own. Your leak will be located using a number of electronic leak detectors. Leak Doctor uses cutting edge technology combining equipment and techniques developed in-house with and the best training available. Equally important is the experience of our technicians. Our technicians receive continuous hands-on training at our state-of-the-art training facility.